in the mid-1930s, the Czech Army was in need of a capable lighttank. The Skoda works was successful in submitting the winning design and itwent into production as the LT vz. 35. Eventually, nearly 300 of the tanks werebuilt with the first entering service in late 1936. Following severalaltercations in the Sudetenland in 1938, the Czech sought to sell off a numberof these tanks. The British were quite interested as it was probably the finestlight tank in Europe at the time. More skirmishes with border nations occurred until the countrywas finally overrun by the Germans in early 1939. 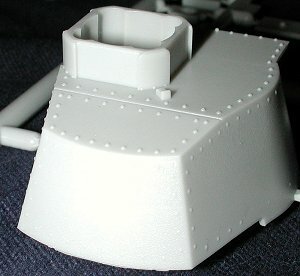 As a result, a large number ofthese tanks were taken into the Wehrmact. They were used with great success inthe Polish and French campaigns and saw some action against the Soviets in 1941.In addition to construction for the Czech army, a large number were built forRomania and a few also saw service with the Bulgarian Army. As youmay know, I'm basically an airplane guy, but I got the bug to see what this kitwas all about. It comes in the standard CMK orange box that opens at the ends.Inside are four fairly large sprues. As you can see from the scan above, most ofthese parts are for the running gear and treads. Thankfully, not all the tracklinks are separate, or this kit wouldn't have a snowball's chance in hell ofbeing built by me! Detailing on the parts is very good with few ejector pin marks in embarrassingplaces and no appreciable flash at all. There is no interior detailingwhatsoever. 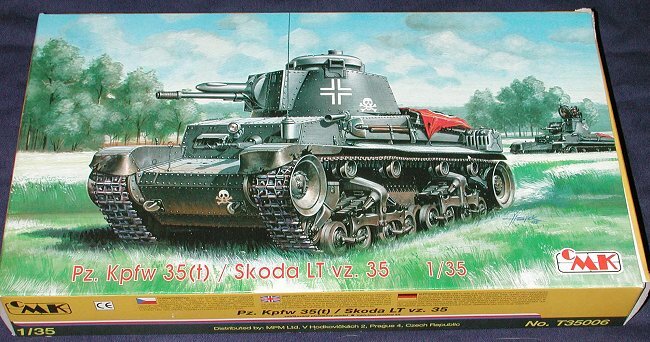 Not unusual for a tank kit, especially one as reasonably priced asthis one. There is, of course, a resin interior built by CMK just for this kit.See this preview for a look-see at it.Just about the only option for the kit, other than decals, is a choice ofmachine guns. Everything else looks pretty straightforward. Most of theconstruction time will undoubtedly be spent on the running gear. Theinstruction sheet is more than adequate to enable you do build a first-ratemodel from this kit. Colors are all referenced to either Humbrol or Tamiyashades. Basically you can build any one offour tanks. Two of them have a three tone camo scheme and are different only bythe plate and the turret number. The other two are in Panzer Grey. One inmarkings for the Polish campaign and the other for the French campaign. Thedecal placement for the last option is on the back of the kit box. The decalsare by Propagteam so you know just what to expect from them. 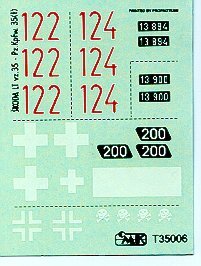 The image of thedecals was darkened so that you could see the white decals more clearly.